You may want to start at the KRLD Pictures Index Page, especially if you have stumbled across this page through the use of a search engine. There's not much on this page, but this first item is a rather rare artifact. This picture is a photograph apparently taken at the KRLD-TV transmitter site back in the 1950s. Back in the early days of TV broadcasting, one way to document the performance of a TV transmitter was to take a picture of an air monitor and file the picture away for future reference. The test pattern shown here almost certainly originated from a monoscope -- most likely an RCA Model TK-1A or perhaps a TK-1C. The monoscope was a black-and-white camera with a test pattern permanently etched into the face of the camera tube. It was just another of the "black boxes" at the transmitter site that enabled the engineers to test the transmitter's performance after sign-off. 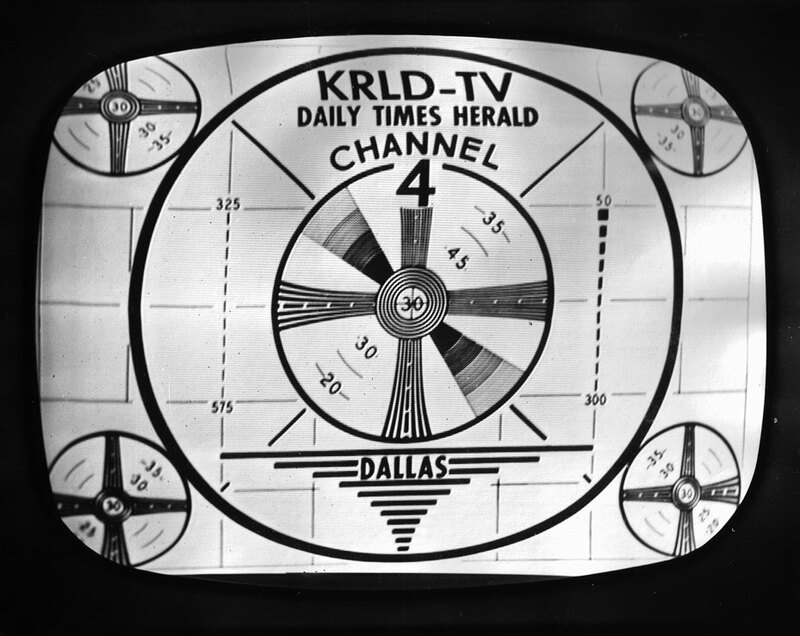 The interesting thing about this test pattern is that KRLD-TV is associated with the "Daily Times Herald". Obviously this is the same entity as the Dallas Times Herald, but this was not a typographical error. The Times Herald was known as the "Daily Times-Herald" from 1888 to 1954. 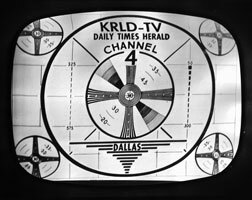 * This monoscope must have been custom-made for KRLD-TV sometime before 1954. The Cedar Hill transmitter site (where this photo was recently found) was not built until 1955, so I surmise that the monoscope was used at the original studio/transmitter site (downtown) before being moved to Cedar Hill. Perhaps I could run the picture through Photoshop to straighten out the skew at the top, but maybe it's better to leave it unretouched. 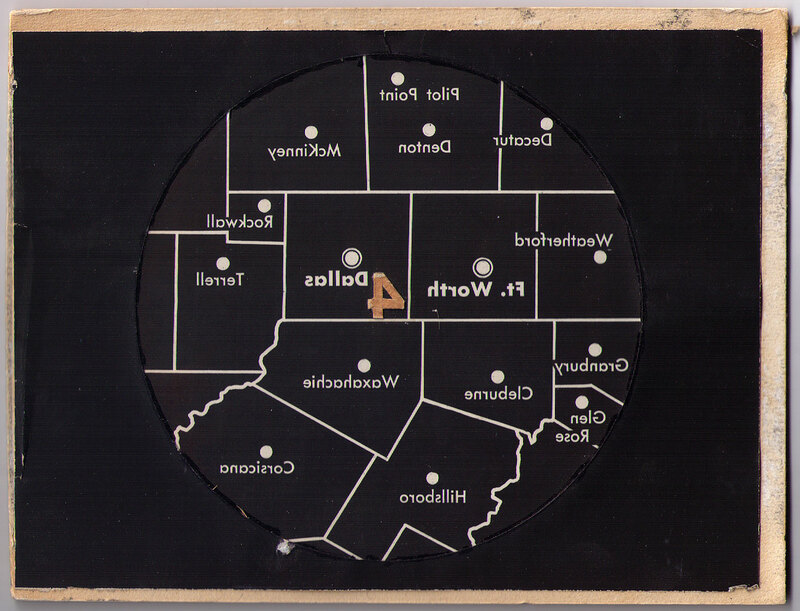 This item is an overlay graphic for the old weather radar. 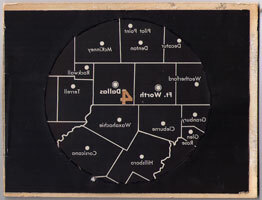 The use of weather radar by TV stations started in the early to mid 1970s, with many stations using the RCA AVQ-10 radar system. (I'm not sure if KDFW used an AVQ-10 or something else.) The radar was located at the Cedar Hill transmitter site, because there is a good view of the sky out there. Much better than downtown Dallas. Yes, the overlay is backwards. It was evidently projected onto the face of the radar's five-inch PPI display, with the radar set on the 150-mile range. Learn more about the AVQ-10 in this AVQ-10 promotional film. Thanks to Dennis Barr for uncovering these artifacts at the Cedar Hill site.